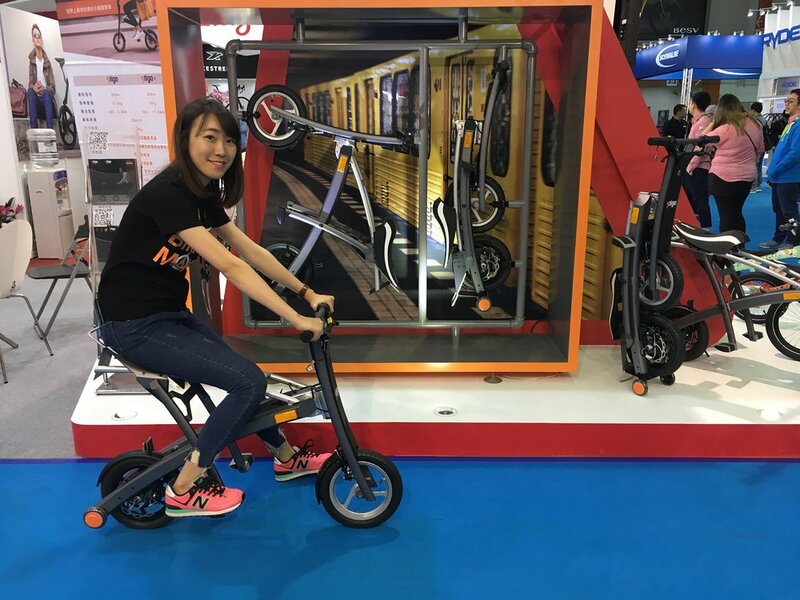 The Taipei Cycle Show of 2017 was our very first visit to such an exhibition, and it was quite an overwhelming experience that felt very much like being a kid plucked out of a remote village and dropped into a gigantic toy shop. It also happened to be our very first visit to Taiwan as well, and an impromptu one at that! The event was held at the Taipei Nangang Exhibition Center from March 22 to the 25th, with the last two days open to the public. It is primarily designed to be a business-to-business trade show, but some companies will choose to unveil new products at this event, instead of waiting for Eurobike or Interbike. Nadiah was on duty with Cycling Plus Malaysia, but as a sightseeing visitor, I managed to drop in on the last day and took a whirlwind tour of two exhibition floors. Here are some of our top picks from the event. Dahon introduced their new Curl model, and had their 35th anniversary edition on display at their massive exhibition area right outside the main exhibition hall. The overall dimensions and fold are surprisingly similar to the Brompton, and we suspect that their price point will be extremely competitive. The Curl is actually being Kickstarter funded and you can check out their Kickstarter project here. The Brompton may have the charm of a UK pedigree that is loved by many, but the urban folding bike market is continuing to grow and we foresee a lot of competition in emerging markets where price points are becoming extremely strategic in growing marketshare. We think this is where Dahon will make a strong entry point for first time buyers. Doesn't that look like an extremely familiar fold? No prizes here to correctly guess what it resembles! Other notable bikes showcased by Dahon include the EEZZ, which weighs less than 8kgs, another seriously compact foldie but with more of a unique fold. The Ciao and E-Vigor e-bikes also made an appearance, but unfortunately these are only available in Europe for now. The latest frame design from Tyrell is a departure from their highly recognizable slanted X, now going for the streamlined triangular frame that was first debuted with the IVE. What we have here is a preview of their pre-production model that will be officially launched within a year, although founder and president Hirose Masahito has promised to speed things up as much as he can. Apparently a touring model is also in the works! Their flagship and performance oriented FSX model continues to wow the crowds with high-end components, but they are also expanding the growth of their IVE lineup which is focused more on the urban cyclist, and we are also seeing them include urban commuter accessories. They are partnering with Thailand-based Vincita for the goods. We can certainly see that the folding bike market is looking more and more at the urban commuter, and it seems that all of the big name folding bike manufacturers are responding to this trend. Take note however that the signature slanted X models are still available. 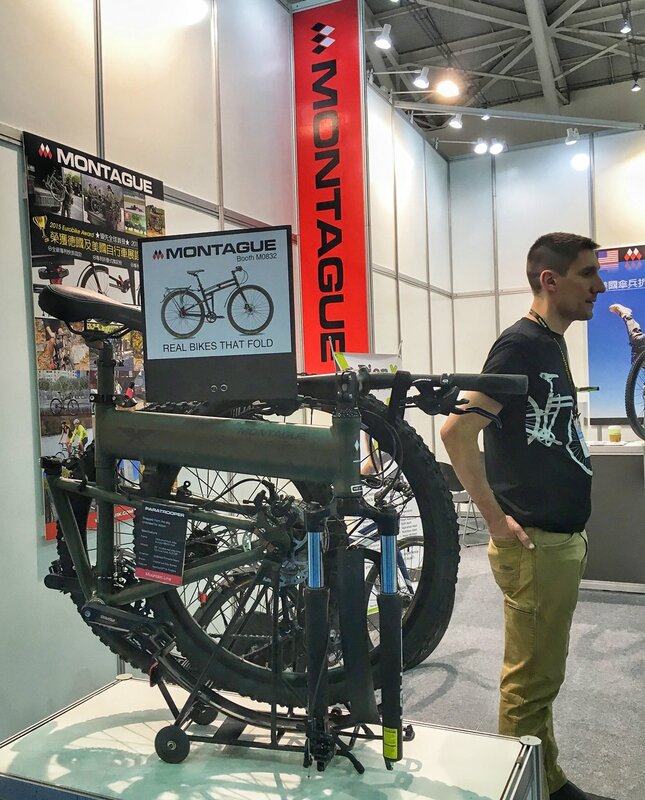 Montague had all of their models on display, from the rugged Paratrooper mountain bike to their newest belt-driven 700c Allston. The most notable update however is a very subtle one, and should get all around nods from commuters everywhere. The standard rack fitted on all of their models gets a key refinement – trolley wheels! For the many would-be commuters out there who are thinking of getting a full-sized folding bike but unsure about maneuverability when folded, Montague has responded to this feedback and added trolley wheels to the rack that allows the folded bike to be pushed around easily. 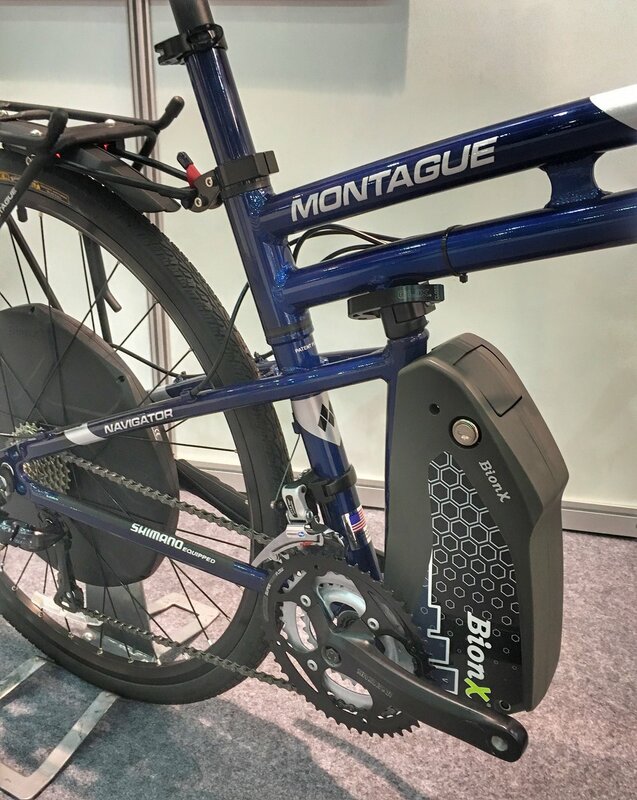 And in response to the boom in interest in e-bikes, Montague has also confirmed they are still tinkering around with their version of a folding e-bike, utilising the BionX system. This design was previously shelved, and has been revived with the latest advancement in the related technologies. There's no firm plan to introduce this model yet, although some distributors are already offering installation as an after market feature. A visit to the Taipei Cycle Show wouldn't be complete without a visit to the Pacific Cycles booth, home to the iconic Birdy and Reach bikes. All models received an overall refresh, ranging from new components from their new U-design division, to subtle but clever refinements to both the Birdy and Reach frames. Most notably though are the introduction of the GT and R variants of both the Birdy and the Reach. The following are some quick highlights of what makes these variants unique. Tires: Schwalbe Black Jack 18x1.9"
The Reach GT and R variants are outfitted with a 1x drivetrain and a super wide range cassette to give an enormous gear range with just a single chain ring. Could this be a trend for some of the 451-wheel folding bikes out there? We're seeing a similar setup with the latest Tern Verge models as well, in particular the Tern Verge X11. You can easily see just how impressive the gearing range is based on those numbers. With the Reach R variant, we are looking at gear inches that closely match a full sized road bike setup running a compact crankset! With such a massive exhibition space and so much eye candy everywhere, you would almost miss the humble booth of Changebike just by blinking. Changebike was established in 2009 and are based in Taichung City, specializing in full-sized folding bikes. Judging by their humble booth, it was clear that they did not have a big marketing budget, but instead spent their resources in designing an extremely clever folding design. The heart of their design is in the frame itself which swivels around the seat post and uses a patented locking mechanism that is unique and features a 4-tooth clamp system that is integrated into the frame of the bike. A secondary clamp just below the bottom bracket prevents further movement when riding as a safety precaution. What really blew my socks off was the total weight of the entire bike using mid-range components: 10kg. Not bad at all for a full-sized folding bike with 700c or 26 inch wheels! What's even more impressive is that it is the ONLY folding frame design to achieve EN 14781 certification which is a strict European 700C frame safety test. Although these guys may not have big marketing dollars, I can appreciate the amount of engineering that went into the design and the company clearly is targeting a broader audience as they have a much more accessible price point. Take a look at the UK distribution website for an idea on pricing. Changebike manufactures two frame types – an MTB frame and a road frame. They had one of each on display, and the MTB frame was outfitted as both a front-suspension MTB and a hybrid commuter. My personal favorite was the 700c road frame, and you can see just how clever the design is from the video below. As it isn't a well-known make compared to some of the other big names out there, finding a Changebike distributor can be a bit challenging. With such a clever and lightweight design, we certainly hope that the distribution channel will grow! And finally foldie makers are of course, always in the unending race to create the smallest foldie in the market. Scroll down for more notable mentions from Taipei in the weird and wonderful world of foldies.